Boutonneuse fever is a fever as a result of a rickettsial infection caused by the bacterium Rickettsia conorii and transmitted by the dog tick Rhipicephalus sanguineus. Boutonneuse fever can be seen in many places around the world, although it is endemic in countries surrounding the Mediterranean Sea. This disease was first described in Tunisia in 1910 by Conor and Bruch and was named boutonneuse due to its papular skin rash characteristics. An eschar is a slough or piece of dead tissue that is cast off from the surface of the skin, particularly after a burn injury, but also seen in gangrene, ulcer, fungal infections, necrotizing spider bite wounds, spotted fevers and exposure to cutaneous anthrax. The term "eschar" is not interchangeable with "scab". An eschar contains necrotic tissue, whereas a scab is composed of dried blood and exudate. 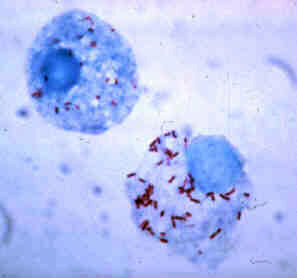 Rickettsialpox is a mite-borne infectious illness caused by bacteria of the genus Rickettsia. Physician Robert Huebner and self-trained entomologist Charles Pomerantz played major roles in identifying the cause of the disease after an outbreak in 1946 in a New York City apartment complex, documented in "The Alerting of Mr. Pomerantz," a short story by medical writer Berton Roueché. 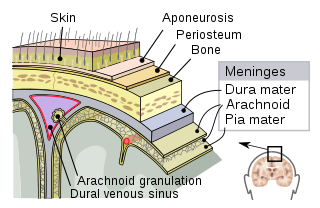 Meningoencephalitis, also known as herpes meningoencephalitis, is a medical condition that simultaneously resembles both meningitis, which is an infection or inflammation of the meninges, and encephalitis, which is an infection or inflammation of the brain. Dermacentor andersoni, commonly known as the Rocky Mountain wood tick, is a hard tick, or member of the Ixodidae family, with three life stages including larvae, nymph and finally adult, or, more entomologically, imago. This tick is generally located in the northwest United States and southwest Canada along the Rocky Mountains. This tick is generally a vector for Colorado tick fever but can also be a vector for Rocky Mountain spotted fever and Tularemia. During the larvae and nymph stages, the tick will not feed on humans, but during the adult stage, it will. However, the larvae and nymph forms will feed on small mammals, including dogs and other wildlife. Prevention of infections associated with these ticks is based on control of exposure to the vector, including: wearing proper clothing when in woods/wet areas, and checking oneself thoroughly after returning home. Adult female ticks can feed for 5 to 15 days, thus it is very important to remove a tick if present. Follow general tick removal tips. Flinders Island spotted fever is a condition characterized by a rash in approximately 85% of cases. ↑ Didier Raoult; Philippe Parola (2007). Rickettsial diseases. CRC Press. pp. 87–. ISBN 978-0-8493-7611-5 . Retrieved 23 May 2010.